South Korea’s leading network operator SK Telecom launched a specialized network for the Internet of Things technology across the country on Monday, marking the world’s first commercial IoT network ever to be deployed nationwide, the company said. SKT’s newly-launched LoRaWAN network, which stands for “long-range wide-area network,” is optimized to transmit small amounts of data at very low speeds of below 5Kbps, making it a fitting network for transferring data from a given object using limited energy. The Korean network operator plans to offer LoRaWAN in conjunction with its LTE-M network launched back in March, which utilizes existing Long Term Evolution wireless broadband technology to service IoT-based devices. While LTE-M is able to transmit complex data with more speed and in larger quantities, LoRaWAN is significantly cheaper to use and more energy-efficient, according to SKT. Together, the two networks are able to cover around 90 percent of Korean territory and reach about 99 percent of the local population, opening the doors to a host of new technologies including off-site monitoring of street lights and manholes as well as wearables to track down lost pets and cell phones, among others, the firm said. “Our nationwide IoT network system will open up a new ecosystem for new businesses, services and infrastructure to thrive in,” said Lee Hyung-hee, president of SK Telecom’s mobile network business during a ceremony held Monday in Seoul to mark SKT’s latest feat. The expanded IoT network will also move forward scores of new technologies, including those utilizing big data, artificial intelligence and cloud computing, Lee said. LoRaWAN’s biggest benefit is its affordability. Its monthly price plans range from 350 won ($.3) to 2,000 won, depending on the data usage around one-tenth of SKT’s LTE-M network service charge. 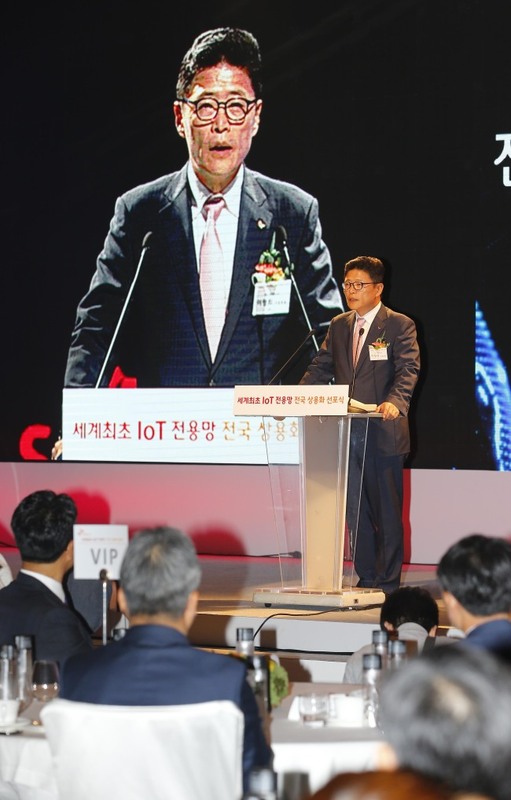 “We introduced the highly affordable pricing plan to help spur the growth IoT market, which has been slow to expand due to the high network usage costs,” Cha In-hyok, executive vice president of SKT’s IoT Solution Business Office told reporters. By charging low network usage fees, SKT is offering scores of new services that could not be launched in the past as the infrastructural costs outweighed the potential profit margins, a chance at commercialization, Cha said. As more IoT services and technologies emerge in the near future, SKT said it expected some 4 million devices to be connected to its IoT network system by 2017. The Korean telecom firm is also working with some 150 partners to build new IoT-based technologies or support emerging services, with aims to commercialize 20 new services by the end of this year, according to Cha. SKT is scheduled to launch its “Safe Watch” service for monitoring minors such as children and the elderly using wearable devices this month, with plans to introduce a village-wide environment monitoring service in August, a manhole monitoring service in September and a real-time parking management system by October, among others. “The key is to build a sustainable ecosystem for IoT-based services. And we believe that such services will be developed by our partners,” he said. SKT expects its IoT network to generate significant sales in the years to come, given the immense growth potential of the IoT market. Market research firm Gartner forecasts that the world’s IoT market will create $1.2 trillion of added value and that 26.8 billion IoT devices will be up and running by 2020.